Technically, it's already Friday and the theme will change soon. I was too excited about this idea that I had - even though the sketch is still very rough, I thought I would share what I have. The theme for Illustration Friday last week was "Reverse". I thought about the story of the Princess and the Pea... what if that story had been in reverse? 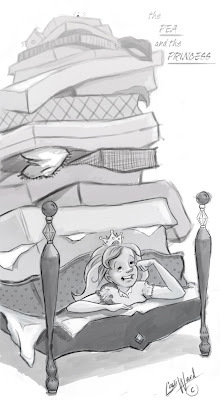 What if, to prove she was a princess, the maid had to sleep under all the mattresses and the pea was placed on top? I think it might be a little harder to prove herself royal! This is awesome! I love her expression. She must have one Strong back! great idea, your Princess looks ,however,very satisfied ! I love it! The Princess looks very satisfied with her efforts of overcoming the uncomfortable pea situation. Perfect for the topic 'reverse'. What a great idea Cali. 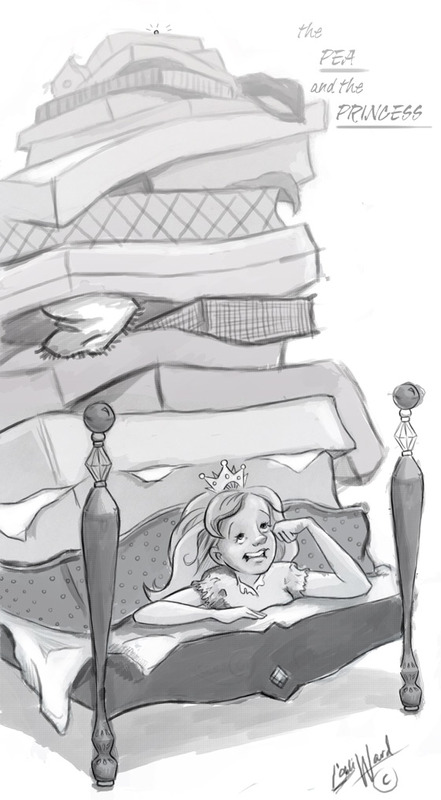 To me the princess looks like she might have a plan up her sleeve to get out from under those mattresses ! !